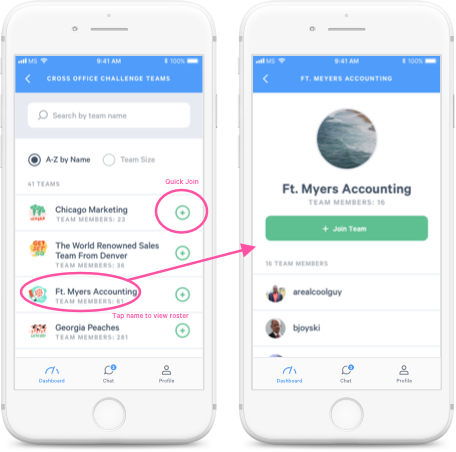 In order to participate in a Team Leaderboard challenge, you will need to be a part of a team. You can join a team from your dashboard following the steps below. 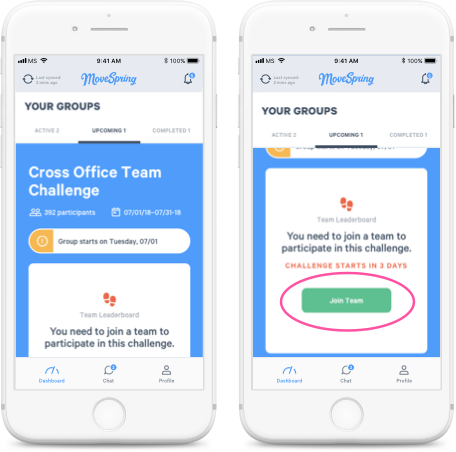 Open your dashboard on the mobile or web app, scroll to the "Your Groups" section. Tap on the "Upcoming" tab to see challenges that are starting soon. You should see your upcoming team leaderboard challenge. If you don't see your challenge, contact your admin or support for help. You’ll see a card that prompts you to Join a team. Tap the “Join Team” button. You will then see a list of all available teams. Tap the green “+” next to the team name to quick join. Or, tap on the team name to view all participants and join from there. Depending on the settings determined by your admin, you may not be able to join a team after a challenge starts. To be safe, it's best to always join a team before a challenge starts so you don't get locked out. You can change your team by clicking "Change Team." You'll follow the same steps as above to select a new team. Questions? Message support - we're always here to help!